* Construct a new database instance using the specified configuration. This is an extremely trivial example, but as you can see, our database object depends on the configuration. If we simply create a single instance of the database, this isn’t a problem– we can simply create a new configuration object and pass it in the constructor. 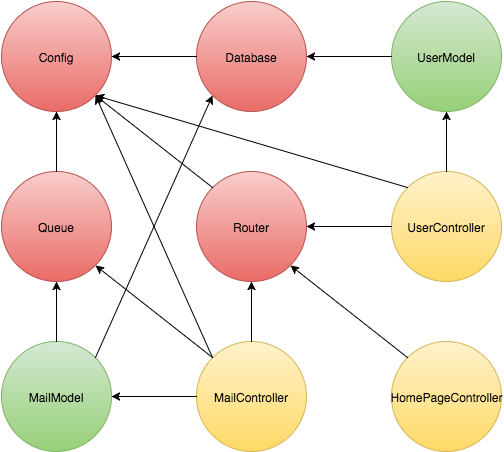 But, what if our application is composed of multiple controllers, utilities, and snippets of code that all need a database instance? Suddenly, we either have to create a large number of database objects (and consequently, a large number of configuration objects), or pass a single instance around somehow. This is the premise of dependency injection: DI takes the premise of passing instances around, and manages this behavior for you. If we apply our example above to a dependency injected system, we actually don’t ever have to explicitly create a configuration object– our DI system does this for us. Laravel’s IoC system is great– it’s wired up throughout the framework so that most method calls end up having dependencies injected automatically, and it even uses the type hints in the method signature to determine what dependencies the method has. The singleton decorator indicates that no more than one instance of the class should be created in the application. If two classes declare a singleton as a dependency, only a single instance will be created which will be injected into the relevant classes that declared the singleton as a dependency. This example is very similar to the PHP example we previously had– a database needs a configuration object to configure itself. As you can see, in our index.js file we have a single call to container.resolve(Database) which does all of the magic: the database instance is created and passed in an instance of the configuration, with both being singletons. If we were to call container.resolve(Database) again, we would receive the exact same instance that was created the first time. Now, we can run container.resolve(Queue) in our index file and get an instance of the queue class. Of course, since this is the first time that the queue is resolved (either explicitly or as a dependency of another object), it is actually instantiated. However, the constructor is passed in the previously created configuration object– the same exact instance that was passed to the database. Wiring that up manually and keeping track of everything would be a nightmare (and this isn’t even close the complexity of a real application), but with Needlepoint you can simply define each class’s dependencies with the decorator. // rules to ignore everything *except* Needlepoint. There’s still a ton of things left to do, but you can always help out by submitting a pull request or even just filing an issue.